This is the English "transcript" of Attacking Alan's speech on the special hearing on the LegCo Panel on Commerce and Industry for Copyright Amendment Bills. This comes from the simultaneous interpretation in LegCo with significant amendments to make it more readable. "This is Attacking Alan from Advance on the Fear. Let me explain what does it mean by "Advance on the Fear". I mean Fear here, not Giants (A Cantonese pun). We have fear, because we are fearful of the government and others who want to suppress us. "For example, the Copyright Amendment Bill will extend the definition of distribution to communication. This is to say if you send so-called infringing copies by electronic or other means, you would be in breach of the law as it may be a criminal offence. This extension would affect people's right on common use. For example, if you share something on Facebook, and those are (alleged) infringing copies, you would be in breach of the law. "So we think if you extend the meaning of distribution as an offence, we would need to extend the rights and protections for copyright users. Such as if their use is non-commercial, or their use does not undermine the (interests of) original work, then it should be protected. "Government has provided three options in this consultation on Parody use of Copyright. I do not think the government has clarify any of the various issues under Option 1 so it is inappropriate to be used. Only criminal liability is exempted in Option 2, but civil liability remains. What does this mean? This means someone (meaning Copyright owner) can sue a civil case or use civil litigation as a threat against derivative works or other copyrighted goods. "Let me use a little bit of time to explain UGC, that is User Generated Content. UGC is either original or derived from other creative works, such as photoshopping pictures, rewriting songs, editing videos etc. These are unrelated to any profit (or monetary gains). So these non-profit making items should not affect the "statutory (this word is added erroneously)" rights of the original works. That is why we suggest the government should go for Option 4 (on UGC Exemption), but they should also exempt parody, satire, pastiche and pastiche (should be caricature here), because this is only fair. "Fair isn't fair if it is prejudiced against one side (original line in English as omitted by interpreter). On the basis of fairness, Option 3 is fair to the user. "Finally, my conclusion is the government should go for Option 3 and Option 4, because this is only fair to copyright users and even copyright owners." 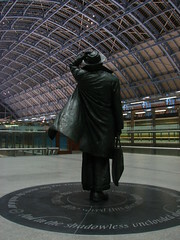 Here are the pictures of St. Pancras Station as I took last night, click on the picture on the right. I don't want to type too much because technically I've got three works to be completed in tomorrow and none of them have had much of a headway. However, I would like to share two incidences just now. Tom Morris seems to be a good influence! 2. After shopping in Waitrose, I went to a local second hand bookshop down Gloucester Road. I bought a couple of bargain books (they worth more than 20p certainly!) that were placed outside the shop, went in and met a lady who was chatting with the attendant to try to get a job (or just flirting with the attendant). I paid and left the shop, but dropped a glove on the way out. I noticed half an hour later and went back to pick up. Just on the way in to the shop, I met the lady again! She turned back to the bookshop after failing to meet her acquaintance from a nearby cafe. Real life is full of unexpected events. Who knows I bought a pair of over-priced gloves in Tie & Rack in Charing Cross after thought that I lost my right glove, and found it (with my beanie) in my now torn backpack? Yes, their engine is one of the noisiest I've ever seen, though hopefully the life extension programme will see the original engine (called Paxman) changed to something just "less" noisy. Some actually lamented the loss of such roar, I, for one rail enthusiast, would definitely not! I studied in Bath for two years between 2002 and 2004, and travelled a lot between London and Bath. The noise that the train pulls in is unbearable even after two years. I certainly would hate standing in between the vestibules, unless I want a full blast sensory experience of what you just described (or I rather stayed there than listening to all the gossips inside the carriage, which at times, gossips are more annoying than those rather predictable noises!). Talking about full blast sensory experience, one of the things I love and hate about Mk3 carriages (the technical name of train carriages used for most loco-led train, including the HST in the UK) is the window on the doors. The fact that you have to put your hand (and sometimes half your body) over the door to push down the door handle outside the carriage to open the door means such window is necessary, and at times one would open the window to feel the breeze, or rather, the gale. Though that opened window itself is another source of noise intrusion from the exterior of the train, especially the bogie and the engine, the draught that is drawn in is sometimes so pleasing! That's why I both hate it and love it -- when I ever walk across the train from carriage to carriage (sometimes towards the kiosk, other times just walking around), I end up opening and closing the windows along. Now, that is a bit of sensory incoherence to you. The conclusions today of the review by the Noble Lord West on the protection of strategic infrastructure, stations, ports and airports - and of other crowded places - identifies a need to step up physical protection against possible vehicle bomb attacks. This will include, where judged necessary, improved security at railway stations - focusing first on those of our 250 busiest stations most at risk - and at airport terminals, ports and at over one hundred sensitive installations. The report proposes the installation of robust physical barriers as protection against vehicle bomb attacks, the nomination of vehicle exclusion zones to keep all but authorised vehicles at a safe distance, and making buildings blast resistant. While no major failures in our protective security have been identified, companies that are responsible for crowded places will now be given detailed and updated advice on how they can improve their resilience against attack, both by better physical protection and greater vigilance in identifying suspicious behaviour. So, he wanted more security across the board in public buildings, such as erecting blast-proof walls and restricted road access to annoy everyone who wants to drop off as close to the place as possible (especially for people with mobility difficulties). Not only that, he also wants to add stop searches at very busy railway stations, which in its very nature is open to the public at most of the times, I don't know how to react on that, as a result that will be subjected to another post. In lieu of combating the climate change, where air travel is the one of the biggest emitter per capita, I'm sure that's why he's stepping up yet more security measures for visible deterrence, both the "terrorist" and "traveller". Mr Speaker, just as we are constantly vigilant to the ways in which we can tighten our security, so too we must ensure that the travelling public are able to go about their business in the normal way. In the most sensitive locations, for example some large rail stations - and whilst doing everything to avoid inconvenience to passengers - we are planning additional screening of baggage and passenger searches. But in the last few months at key airports there has already been additional investment in new screening capacity. We have been able to review the one-bag per passenger rule and the Transport Secretary is announcing today that as soon as we are confident that airports are able to handle additional baggage safely, these restrictions on hand baggage will be progressively lifted. Check-in baggages screened with X-ray machine prior to approaching check-in counters for all destinations, not just the US, not just a number of airlines. That would of course include budget airlines. Normal security procedures like any other airport at the security gate. However, Japanese have already concerned with explosive liquids (read molotov cocktails) before 2006 transatlantic aircraft plot. Where the hell you can find such security? Narita International Airport, the International Gateway of Tokyo. Why? Because of the use of land to build the airport. That's why most new airports in Japan are built by the sea: it is easier to buy off fishermen apparently. I'm sure some people would like to travel like that, right? When they arrived and departed in Japan, they also got their shoes searched. However, the security attendants provided them sleepers when their shoe got searched, they even offered a cup of tea. Now this is the way to treat your suffering passengers while scanning. As I have heard, there is a wide-spread tube strike in London at the moment. Simon moaned that he is not looking forward to go to Newbury for the next few days. I believe many of you would have the same feeling under such crippling strike. Here are some of my tips you can get around a bit. Yes, you should read not just the Tube Map, but the Tube and Rail Map like this. So, say you live in the South-West of London and you're trying to get to Newbury. Forget about getting to Paddington first even though it is usually quicker: go through South West Train and change at Reading. Where to get on this particular train to Reading? Clapham Junction mate. Even though the journey between Clapham and Reading is about 50-60 60-70 mins, it'd beat getting stuck at the traffic trying to get into Paddington! If you can afford to work at home, do so. You'd alleviate people from crushing buses. I'm coming back to London on 24th September and study Electrical Engineering again. This is not intended to be a concisive update, in fact I'm doing this on a high speed screeching bus heading back to my home in HK. Just spoken to a couple of mates here, they're pleased that I'm back to say the least. Well I've a lot to update but whether I bothered to do them is another question. I'll tell you more once i had back home. Suddenly I have an urge to post this here. Perhaps I was stirred by someone posting Scarborough Fair (via sf)? Gwlad beirdd a chantorion enwogion o fri. Please note that only the first verse it used for the anthem. Yes, yes, I know I've almost abandoned this space for a few months. I just haven't got the incentive to write down my thoughts here as things weren't going to well on my side. I've decided to re-post comments I have made in other places here to prop up my blog. I should have been busy at the end of last term since I procastinated a lot, especially I left quite a bit of work for this holiday... Even my plans in revamping this blog has to take a back seat because of my coursework. So I think that's why although this post started before 2006, it finishes on 5 January, before I left for the flight back to London. Anyway, Blwyddyn Newydd Dda/新年進步/Happy New Year! You scored 66% Organization, 35% abstract, and 37% extroverted! You are somewhat organized, more concrete, and more introverted. Here is why are you Cookie Monster. You are both somewhat sloppy. Actually you are probably a lot less messy than Cookie Monster. Cookie Monster can be messy when he is eating, but he doesn't usually lose things. You are probably mostly organized. You have a good idea where you put things and you probably keep your place reasonably clean. You aren't totally obsessed with neatness though. You both can be concrete thinkers. Cookie Monster knows what he wants (cookies!) and he consistently works toward that goal. You probably know what you want in life, and you have a real plan toward achieving it. You are both introverted. Cookie Monster only thinks about himself when he says "Me want cookies." He rarely thinks of the affect he has on others. For whatever reason you are uncomfortable in social settings. You probably have one or two people that you are close with. You'd rather do things by yourself and you dislike working in groups. Well, that's quite expected actually, many people used to comment that I'm quite like Cookie Monster. By the way, if you don't know, Sesame Street used to be my extra favourite TV programme, I demanded it to be recorded and replayed through-out the day when I was like 5 and 6! Well, since I went back home and reprimanded of my appalling exam results, I haven't blogged for quite a while. Since I have now got internet connection at my London flat, I can make comments on other blogs and write my own blog again. I'm really sorry for the long wait you might have encountered. Also, I haven't changed my template yet, due to general laziness, I'll sort that out before new year (that is if I can finish my other academic stuff. Here is a poem from my sister. She asked me if I could publish it, so I publish it here. All rotct apple of peace all divine. This blog site would be changed to a more active site as I'm going to move my active postings from Xanga to here. In the mean time please still go to my Xanga site for my blogs. ALL previous posts in this site are deleted from now on. As you see, I'm semi-abandoning here! ;) I'll tell about more of myself later.